For a second time this fall theater season, a play is dealing with the Rapture, that moment when believers will ascend and everyone else…doesn’t. 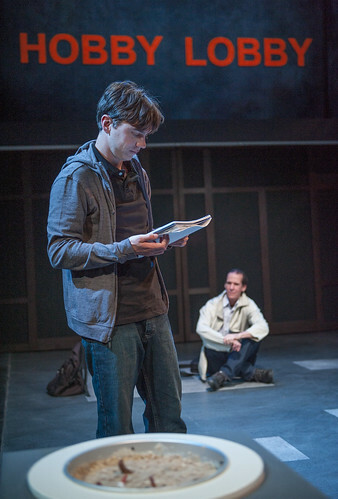 First it was the young gay actor in the San Jose Repertory Theatre production of Geoffrey Nauffts’ Next Fall (read my review here). He worried that as a believer, he would spend eternity without the comfort of his boyfriend, a non-believer, and the boyfriend kind of rolled his eyes and dismissed the whole Rapture thing as nonsense. Now we have Samuel D. Hunter’s A Bright New Boise at Berkeley’s Aurora Theatre Company in which a staunch believer has his faith shaken by a terrible event at his northern Idaho church enclave (cult?) and attempts to make a fresh start in the bustling metropolis of Boise. Like the plays of Annie Baker, Hunter’s drama unfolds against he bleak backdrops of modern life. For Baker it’s places like a rec room or a yard behind a cafe next to a Dumpster. In Hunter’s Boise it’s the break room of big-box hobby supply store and a parking lot. These aren’t places we usually see on stage, and Hunter’s characters aren’t those we’re don’t usually get to know in a theater. That’s what makes Boise such an interesting play, and director Tom Ross’ production heightens that interest with richly detailed, heartfelt performances from each of his five actors. Want to know what it’s like to be a success in the big-box world? Look no further than Gwen Loeb’s stunning turn as Pauline, the manager of the Hobby Lobby and the person who turned it from a chaotic mess into a profit maker. The folks at corporate are mightily pleased. But Pauline’s recipe for success is unusual, a mix of foul language, quick temper and genuine motherly concern. Among her staff are a painfully shy girl with a troubled home life and precious few retail skills (Megan Trout as Anna) and a hothead who expresses his disdain for his job through T-shirt art (Patrick Russell as Leroy). Then there’s the new guy, Will (Robert Parsons) who just moved to town. We know he’s escaping a tragic scandal at his church, but he’d rather nobody knows about that — or that he’s living in his car. He’s also there, we quickly learn, to reconnect with his son, Alex (Daniel Petzold), a high-schooler who also works at the store. Will gave up the baby for adoption and has had no contact since. As part of his fresh start in Boise, he wants to be the father he never was. But Alex, who demonstrates a rather tenuous hold on his young life, is not going to embrace this sudden father with anything but belligerence, hostility and only mild curiosity. The power struggle between these two, with Alex taking the reigns much of the time, is so painfully intimate it’s almost hard to watch at times. Though the scenes between Parsons and Petzold crackle with resentment, desperation and the soul-deep need to connect, the scenes that really come to life are between Parsons and Trout. Unlikely friends, Will and Anna both have reasons for sneaking back into the store late at night. Trout’s Anna would rather read a book than do anything else, so when she makes an effort to talk to Will, it seems as if everything she says pains her. If she’s not apologizing, she’s berating herself for being stupid. Anna a fascinating character and Trout offers a beguiling performance. There’s a lot of interest among the characters about what Will believes. Does he really believe in the Rapture? After all he’s been through, does he still believe in God? Those are big questions, and Hunter’s play isn’t afraid to wrestle with them. His ending goes for thought provoking but ends up being more frustrating, which is only disappointing because for two hours, the play gives such vital voice to people whose lives don’t seem to amount to much, but who are, in reality, battling demons and desperately searching for the meaning of their lives. Samuel D. Hunter’s A Bright New Boise continues through Dec. 8 at the Aurora Theatre Company, 2081 Addison St., Berkeley. Tickets are $32-$50. Call 510-843-482 or visit www.auroratheatre.org.